The reviews and viewer comments are in and the Tom Cruise Fan Club has spoken. Everyone, well, almost everyone, loves the new MISSION: IMPOSSIBLE film. Yes, you read that right. Not everyone loves the film. I thought it was complete rubbish and so did quite a few other people who saw it with me. A good dozen of them walked out before it ended, probably because sleeping in their own bed was a more pleasant option for them. One of my friends tempered her critique of the film by saying “it was better than the last few in the series”. I wouldn’t know. I only saw the first one – an amazing 22 years ago – and I wasn’t impressed back then either. Maybe I’m just stuck in my nostalgia for the TV series, which aired between 1966 and 1973, although I’ll readily admit that by the fifth season, the show was fast approaching its sell-by date. 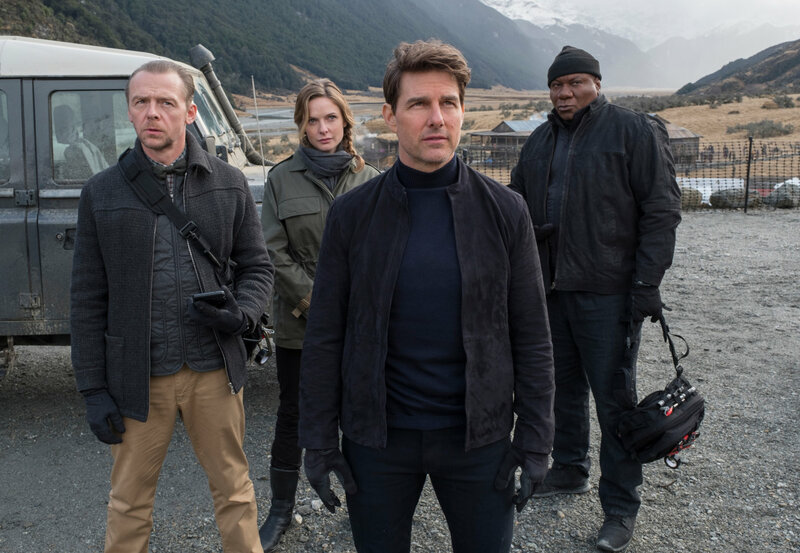 Before you dismiss me altogether as being a Tom Cruise hater, let me explain why I am more than slightly underwhelmed by MISSION: IMPOSSIBLE – FALLOUT. I’ll start with the story, which is completely predictable after 45 minutes. I know because I looked at my watch when I figured out the film’s ending. In this installment of The Impossible Missions of Ethan Hunt (Cruise) and His IMF Friends, the group accepts a two-pronged mission: first, to intercept three plutonium cores that were stolen from a Russian facility in Siberia before they fall into the hands of a terrorist group called The Apostles (you’d think Putin would be all over getting them back and executing a few people in the process but you’d apparently be wrong because the Russians are nowhere to be seen), and second, to apprehend a shadowy character by the name of John Lark and stop him from getting hold of the nuclear material and turning it into bombs. Easy enough for the IMF, except that no one knows what John Lark looks like. To complicate matters, the Apostles want Solomon Lane (Sean Harris, TRESPASS AGAINST US; ’71) released into their custody. If you remember from the last M:I film (ROGUE NATION), Lane is a former MI6 agent who went rogue. Then there’s Ilsa Faust (Rebecca Ferguson, THE GREATEST SHOWMAN), the MI6 agent from ROGUE NATION who is also back. She says she wants to help Hunt but does she? And finally, to really mix things up, CIA Director Erica Sloane (Angela Bassett, BLACK PANTHER) decides to throw her weight around with the IMF and insists on placing one of her people, August Walker (Henry Cavill, Superman), an assassin working for the Special Activities Division (“SAD”? That’s the best acronym they could come up with? ), to keep an eye on Hunt and his team. It isn’t a great stretch to figure out who’s really on who’s side here but even if you can’t connect the dots after three-quarters of an hour, about ten minutes later, the answer in the shape of a mobile phone is offered up on a silver platter. What was writer-director Christopher McQuarrie thinking? This is the same guy who wrote the screenplay for THE USUAL SUSPECTS! Can you imagine if Kevin Spacey announced 45 minutes into the film that he’s Keyser Söze? (My apologies if you haven’t seen the movie yet but it’s already been 22 years since it came out.) Why give away the ending so blatantly, especially when there’s still almost an hour and half to go? To add to the face palming, about ten minutes after that, McQuarrie drops a couple more hunks of bread, which address even the tiniest of doubts you may still have about the ending. The story also tries to add some jocularity between the IMF team members during times of crisis but these guys are no Tony Stark, Thor and Peter Quill. Perhaps it’s the writing again that’s lacking because many of these scenes elicit polite chuckles at best. As lame and absurd as the storyline is – especially in the third act, there’s also the acting which is OMG awful. If we had any thoughts before this film that Henry Cavill’s turn as the Man of Steel has been hampered by bad scripts, we now know that no, he’s just a horrible actor. Even with his now infamous moustache, which was CGI-ed out for the JUSTICE LEAGUE reshoots, Cavill is as wooden as they come. But Tom Cruise Fan Club members will counter that it doesn’t matter because this film is really all about Cruise. And they’re right because Cruise IS the film, as he gets to show off his stunt work running across rooftops, skydiving, jumping from one roof to another (which is how he famously broke his ankle), engaging in hand-to-hand combat with bad guys, dangling off a helicopter, motorcycling and driving at breakneck speed against traffic through the streets of Paris, climbing up a Himalayan rock face and more. At 56, Cruise is the human embodiment of the Eveready bunny, which is just as well because Ethan Hunt is the personification of a Timex watch – he takes a licking and keeps on ticking. But even Cruise is making noises that his days of doing his own stunts may be over. He’s been searching for a new franchise to attach his name to but without success. Last year’s THE MUMMY met with generally negative reviews and put the future of Universal’s Dark Universe franchise in doubt. His next project, TOP GUN: MAVERICK, which is due out next summer, might be the one, although it would be hard to imagine him having a prominent role in the franchise going forward. Perhaps my friend who said that at least M:I – FALLOUT is better than some of its predecessors is right but I’m not about to find out if she is. As I’ve done with every STAR WARS film since Episode VI, I’m not about to give this film a pass just because some previous films in the franchise were worse. For me, watching 2-1/2 hours of elaborate action set pieces and high-octane stunts with Hollywood’s hardest working actor today is not enough. I also want a story that has some semblance of surprise and tension, and acting performances that aren’t laughably bad. Watch the review recorded on Facebook Live in RTHK Radio 4’s studio on Thursday, August 2nd at 8:30 am HK time! Oh Howard…lighten up! It’s summer…the silly season for movies! Me, lighten up? Yeah, that’s not gonna happen!